Whether congressional Democrats accept or reject Barack Obama's Iran deal has great importance and is rightly the focus of international attention. But there's another debate taking place over the Joint Comprehensive Plan of Action that may be even more critical: the one in Iran. Supreme Leader Ali Khamenei, the country's decision maker, just might reject the laboriously worked-out agreement that he helped negotiate. On one level, that makes no sense. As a plethora of analyses have established, the Vienna deal is enormously favorable to the Islamic Republic of Iran, legitimizing its nuclear research, assuring its future nuclear weapons program, helping its economy, and boosting its aggressive international goals. These advantages would make it appear absurd for Khamenei not to accept the deal. Plus, most Iranians celebrate the accord. But rejecting it makes sense if one focuses not on those immediate advantages and instead looks at its future dangers to the Iranian regime's surviving. Leaders of fanatical and brutal government such as Khamenei's invariably make ideological purity and personal power their highest priorities and he is no exception. From this point of view – its impact on the regime's longevity – the deal contains two problems. First, it betrays Ayatollah Khomeini's vision of unyielding enmity to the United States, a core principle that has guided the Islamic republic since he founded it in 1979. A substantial portion of the leadership, including Khamenei himself, hold to a purist vision that sees any relations with the United States as unacceptable and bordering on treachery. For this reason, Tehran has long been the world's only capital not seeking improved relations with Washington. These rejectionists disdain the benefits of the deal; they refuse it on grounds of principle. Their position is hardly unique. Similarly, Palestinian rejectionists oppose treaties with Israel, regardless of their potential benefits, not wanting to truck with the enemy. (Think of the 1993 Oslo accords, which brought land, money, legitimacy, and guns.) Principle trumps practicality. Second, Iranian opponents of the JCPOA worry about its eroding the Islamist values of Khomeini's revolution. They fear that the businessmen, tourists, students, artists, et al., perched soon to descend on an newly-opened Iran will further tempt the local population away from the difficult path of resistance and martyrdom in favor of consumerism, individualism, feminism, and multiculturalism. They despise and dread American clothing, music, videos, and education. 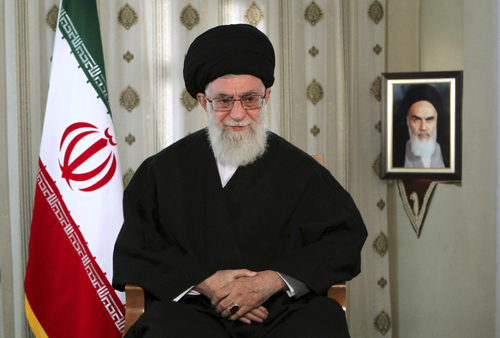 Khamenei himself talks of the U.S. government seeking a way "to penetrate into the country." From their point of view, isolation and poverty have their virtues as means to keep the Iranian revolution alive. In short, the Iranian debate over the deal is a genuine one, pitting those who argue in favor of the deal's short-term benefits against those fearful of its long-term dangers. Khamenei must make a difficult choice. Iran's Supreme Leader Ali Khamenei, with Ayatollah Khomeini pictured. Back in the West, opponents of the deal will, of course, rejoice if Khamenei rejects the deal. But his doing so also presents them with a problem. After claiming that Obama has given away the store, they must confront the awkward fact that the Iranian leadership turned down his offer. As Obama emerges as an apparent hard-liner who protected American interests and out-bargained the bazaar merchants, their argument collapses. His accusation about their "making common cause" with the Iranian rejectionists will look newly convincing and terribly damning. Israel's prime minister Binyamin Netanyahu, currently in Obama's dog house, is especially at risk of being dismissed as foolish. 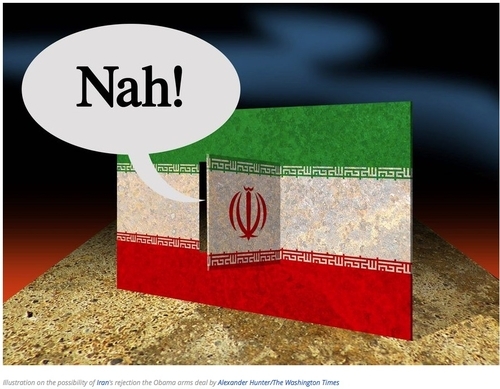 To avoid this fate, the deal's opponents must immediately prepare for the possibility of an Iranian "no." That means their taking several steps: Pre-empt Khamenei by foreseeing and even predicting his rejection of the deal. Explain (as I have done here) that his reasons have nothing to do with its substance and everything with the purity of ideology and maintaining a revolutionary spirit. Develop a familiarity beyond the terms of the JCPOA and learn the intricacies of Iran's domestic scene. Hone anti-Obama arguments (such as: he deluded himself into thinking he had a negotiating partner when none existed). Devise a detailed policy toward Tehran that renews economic sanctions and enforces other penalties. Find allies internationally to help implement this renewed sanctions regime. Prepare the public for the possibility of destroying Iran's nuclear infrastructure. Khamenei's rejection of the Vienna deal would be great news for everyone and especially for the deal's opponents – but the latter urgently need to prepare for this eventuality. (1) that some of its details could expose Iran's security and military data to the West or significantly cripple the nuclear program without proportional sanctions relief -- allowing the Supreme Leader's redlines to be crossed; (2) that the deal, whatever its details, is designed to open the country's door to Western economic and cultural influence and gradually drain the Islamic Republic of its ideological content, transforming it into a Westernized government. This second point has been a particular focus of Khamenei's post-deal speeches. Beware, a hostage deal might hurt the U.S.